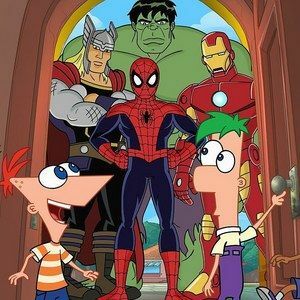 Two iconic universes collide when Marvel and Disney characters team up in Phineas and Ferb: Mission Marvel, a landmark Phineas and Ferb episode in which Marvel Super Heroes and the popular animated duo, Phineas and Ferb, defeat Marvel Super Villains and Dr. Doofenshmirtz, in an epic battle of good versus evil. USA Today has a special sneak peek clip, which finds Marvel's mightiest heroes swapping powers, leaving Hulk with Tony Stark's snark and Thor with the ability to crawl walls like Spider-Man. Check out all the action and comedy, and then stay tuned as The Disney Channel airs a special 90-second extended look at this special Phineas and Ferb epsisode, airing this summer on August 16. A 90-second sneak peek of Phineas and Ferb: Mission Marvel, which teams the Disney animated pair with A-list Marvel Comics superheroes, airs on Sunday during the premiere (11 a.m. ET/PT) of the Marvel's Avengers Assemble animated series on Disney XD.